Has anyone else looked at photos of beautiful Christmas trees in magazines or on Pinterest and wondered.. 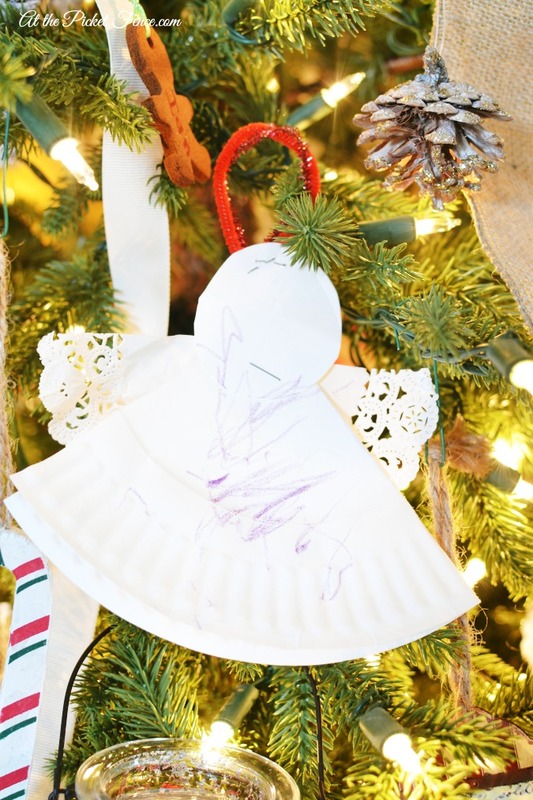 The paper angels, the picture frames made out of popsicle sticks and the cotton ball snowmen? 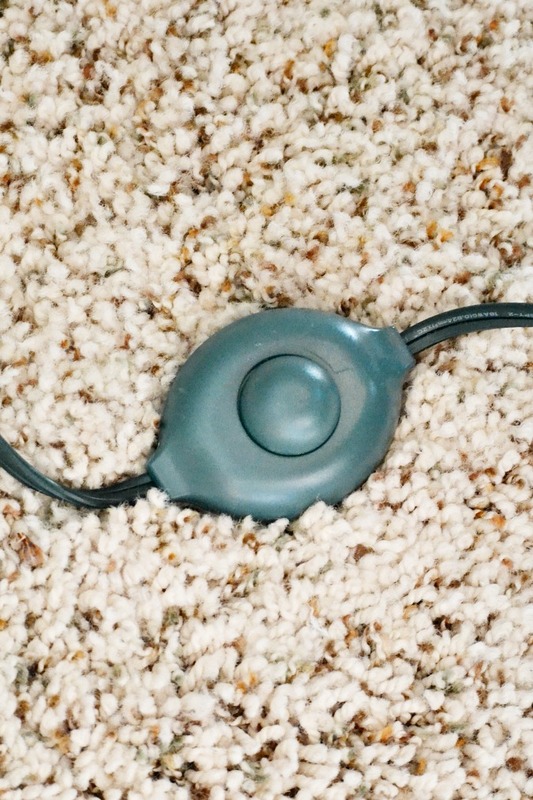 I always wonder if they are frantically removed before the photo is taken or if they are hanging on the branches of the Christmas tree that gets relegated to the deep recesses of the house like the basement or the playroom. But, the thing is, those precious homemade treasures are kinda sorta my most favorite of all the ornaments. So that is why, in our house, they have their very own Christmas tree to hang on. We call it our ‘Family Tree’…pun intended! 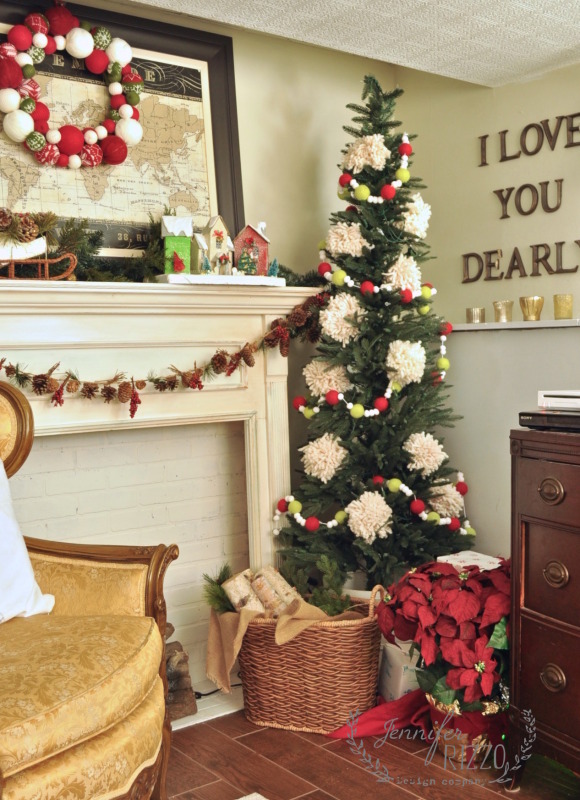 And this year I was so excited to have the opportunity to select a tree from Balsam Hill that would be perfect for this little corner of our family room. The Slim Red Spruce fit the bill perfectly! 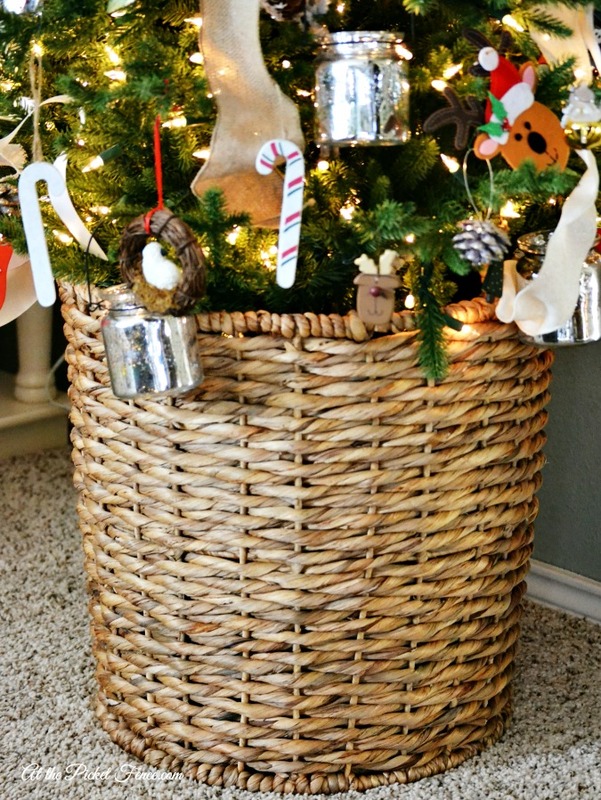 Putting it in a giant basket not only adds a lot of charm and texture, it also keeps the floor space open since this is definitely a high-traffic area in our home. 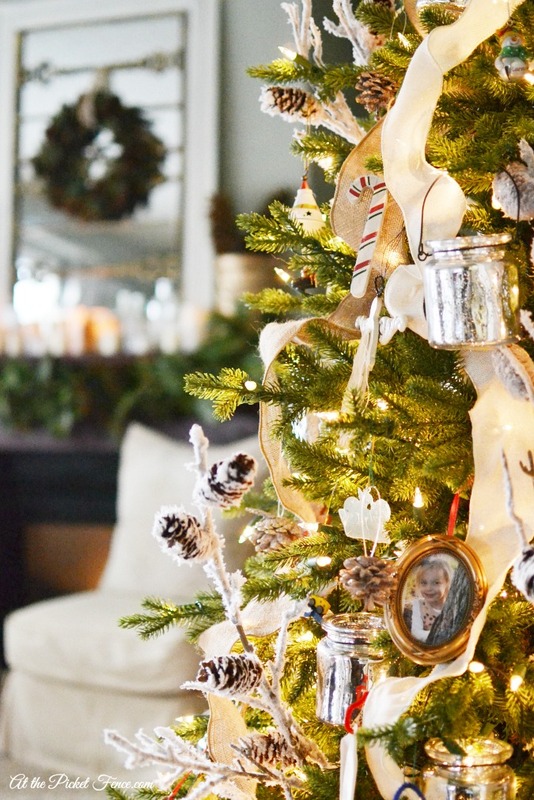 And can I just say that while I love everything about this tree, I think my most favorite part is this button light switch which I can turn off and on with the tap of my foot! 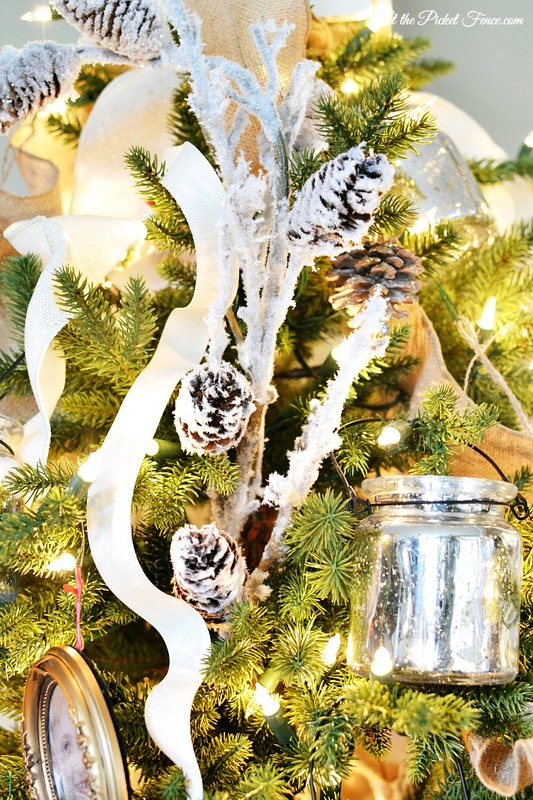 Adding some frosty branches and mercury glass jars helped add some sparkle to the tree and I truly believe the more ‘fancy’ ornaments and the homemade ones can peacefully co-exist and create a wonderful layered effect. My photo box tree topper completes this family tree. 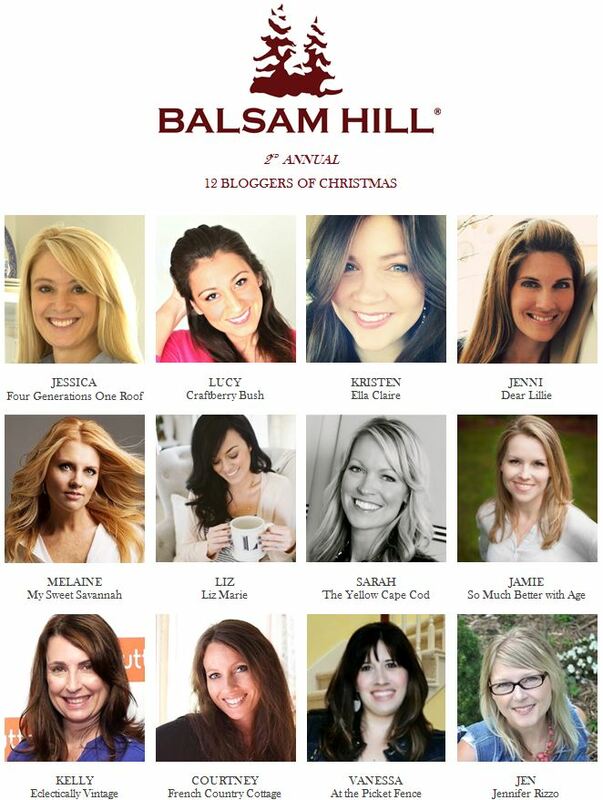 I’m so thrilled to be joining Balsam Hill for their 12 Bloggers of Christmas series and you can find me today on their blog sharing more about my Christmas decorating ideas, inspiration and some personal stories about how to add more meaning to your home this season. 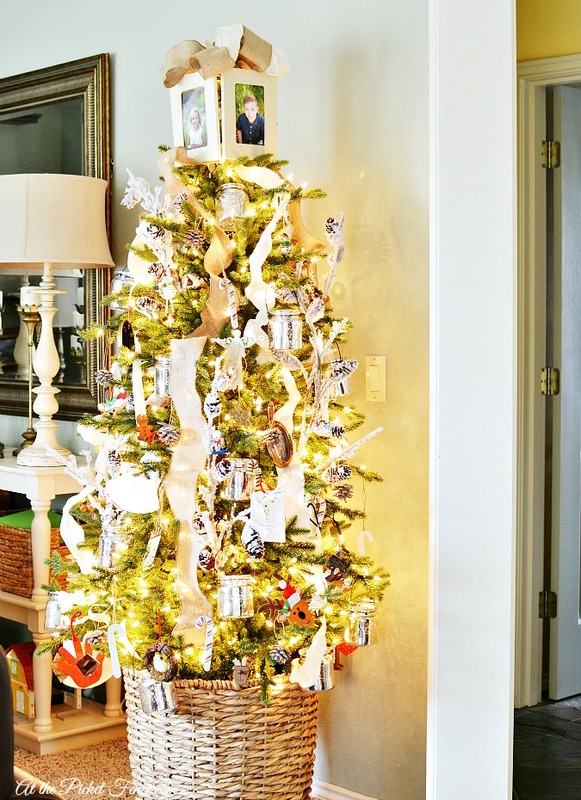 Next up is Jennifer Rizzo’s gorgeous Pom Pom Christmas tree so be sure to stop by and check it out in all of it’s fabulousness! And be sure to head over to Jennifer Rizzo Design Company to enter the HUGE GIVEAWAY with over $2,000 in prizes from Balsam Hill!! 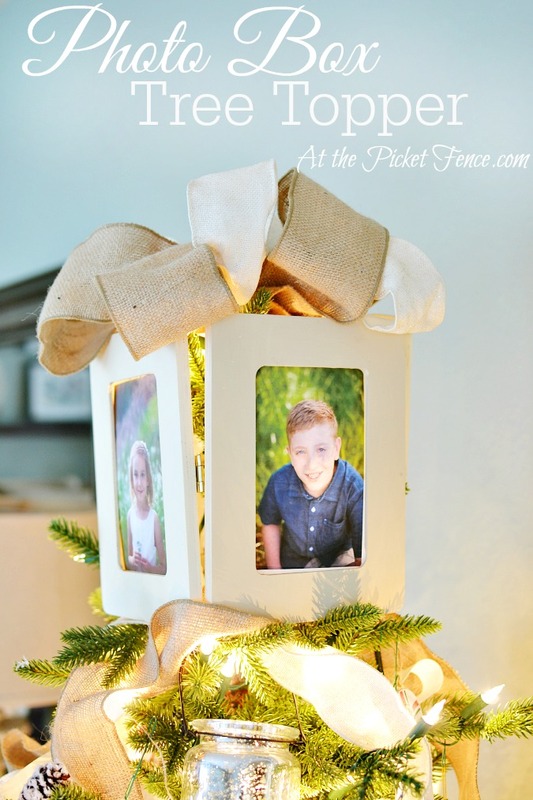 19 Comments on "Our Family Christmas Tree"
Your family tree is gorgeous and I love the photo box topper! I’m pinning! Happy Holidays! I love your tree. I have vintage ornaments from when I was a child, and all of our grown children’s “home made” ornaments that are now, also, 40 some years old on our tree. Old glass and “art masterpieces”. That’s a wonderful combination for a meaningful Christmas tree in my opinion. Did the basket come with the base inside? Any stands I have tried with galvanized tubs or baskets are always too large in circumference to fit. Hi Teresa! So, I didn’t put the tree in the stand that came with it but instead left it like a ‘pole’. I placed that inside a smaller pot and then put that pot in the basket. Does that make sense? LOL! This is perfect — the topper is amazing! What a statement piece this is. I only have one tree and it’s a “Family” Tree. Each year I THINK about creating a “dream” tree but I just so enjoy the ornaments from over 30 years of memories and all of the kids’ homemade ones, the ones with their pictures, etc. I actually was thinking that I should “catalog” them all. Especially ones that were given by neighbors, people from church, etc. that no one but me will remember years from now (and maybe not even ME!). It’s gorgeous, Vanessa. I love a mommy tree and a kid tree. It’s the smart thing 😉 Love your tree topper. Yes, your explanation makes sense! I will have to try it. So pretty. Thank you! 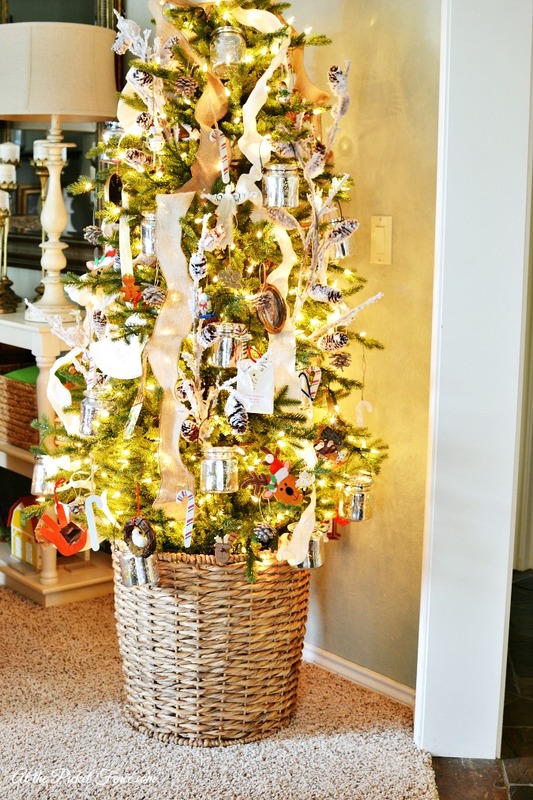 Your tree and ornaments are just beautiful! Love the basket. Merry Christmas to the Picket Fence Family! I mix my pretty Radko ornaments with my handmade ones made by family and friends….it makes the tree special…I have a Balsam Hill tree and love it…my hubby also purchased the “tap” extension cords and they are the best!….Gorgeous tree Vanessa!…..love the topper! Love your tree! And yes all the hand made ornaments are very special at our house – even after 34+ years! I too have a mommy tree of ornaments that I have collected and received as gifts through the years. LOVING your Christmas tree! I’ve grown up with an artificial tree and living in Florida a fresh tree just isn’t worth it. I think that most artificial trees these days look better than the real ones! I love your tree! I agree that the memories from those handmade ornaments can be beautifully displayed and happily coexist with other ornaments! Love how you accomplished this and pinning!